Tsipras and Macron are reshaping the foundations of a Franco-Greek relationship that has been developing since the Greek Civil War (1946-1949). Emmanuel Macron on the Pnyx hill, Athens on Thursday 7 September 2017. 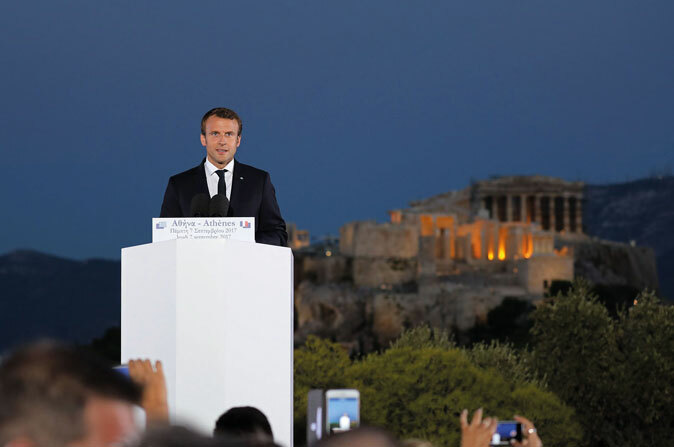 Greece is coming out of the crisis and I want France to play its part in this moment”, said Emmanuel Macron, during his visit to Athens last September. Accompanied by a delegation of French business leaders, the President assured that nobody should hesitate to invest in a country that is returning to growth for the first time in eight years. Emmanuel Macron even stated that European investors had missed opportunities in recent years. He referred to the port of Piraeus, handed to the Cosco, Chinese company: “We pushed Greece to feel forced to choose non-European investors because the Europeans were no longer there. I call on the Europeans to come back, the Greek economy deserves to choose from a diverse offer and in particular France has to show up.” Currently, 10% of foreign direct investment in Greece is French. Beyond economic relations, France and Greece are bound in common history. The French language was not long ago taught in all schools in Greece, not to mention the birth of philhellenism in France in the nineteenth century and following Greek independence. The Greek diaspora in France also played an important role in the Franco-Greek friendship. During the Greek civil war, from 1946 to 1949 and during the dictatorship of the colonels from 1967 to 1974, academics and artists, as well as politicians like Constantinos Karamanlis, who became Prime Minister after the fall of the colonels, all went into exile in France. When the dictatorship of the Colonels fell in 1974, Valéry Giscard d’Estaing was elected President of the French Republic and was the first to visit the new Greek Prime Minister Karamanlis, and he later actively supported the accession of Greece to the European Economic Community in 1981. “We do not shut the door on Plato”, had declared Valery Giscard d’Estaing. After Alexis Tsipras led his radical left-wing party to winning the January 2015 elections and went on to become Prime Minister, it is again France with President François Hollande that stood as the best ally in times of turmoil. While European countries like Germany were considering a Grexit from the eurozone, François Hollande acted as a mediator and avoided a catastrophe.